Sockdolager sails out of Auckland in a spanking Southwesterly breeze. 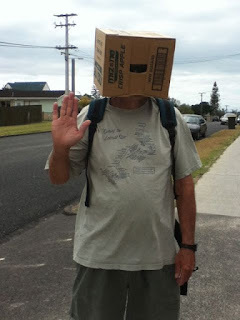 Bye, Auckland! We’ll miss you! 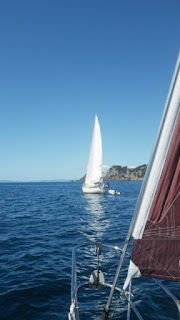 Waiheke Island, New Zealand: We have “eventfully” circumnavigated the entire coast of Waiheke island (okay, it’s small) and are at anchor in Oneroa Bay, waiting for some funky weather to clear before crossing the Hauraki Gulf to Great Barrier Island, 40 miles to the NE. 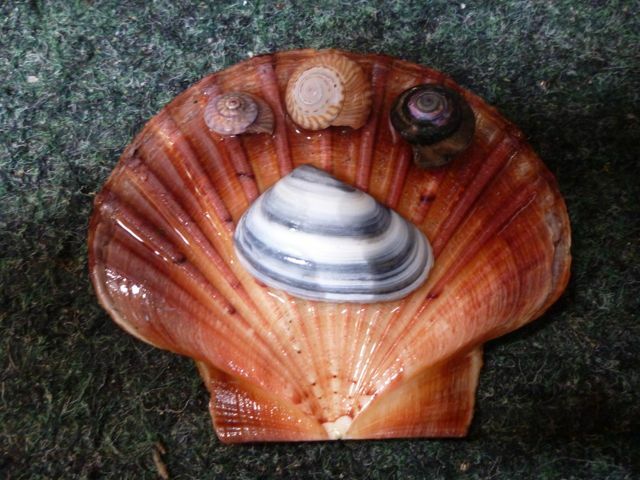 Great Barrier has some excellent hiking trails and interesting ecology, not to mention loads of seabirds, so we’re excited to see it. 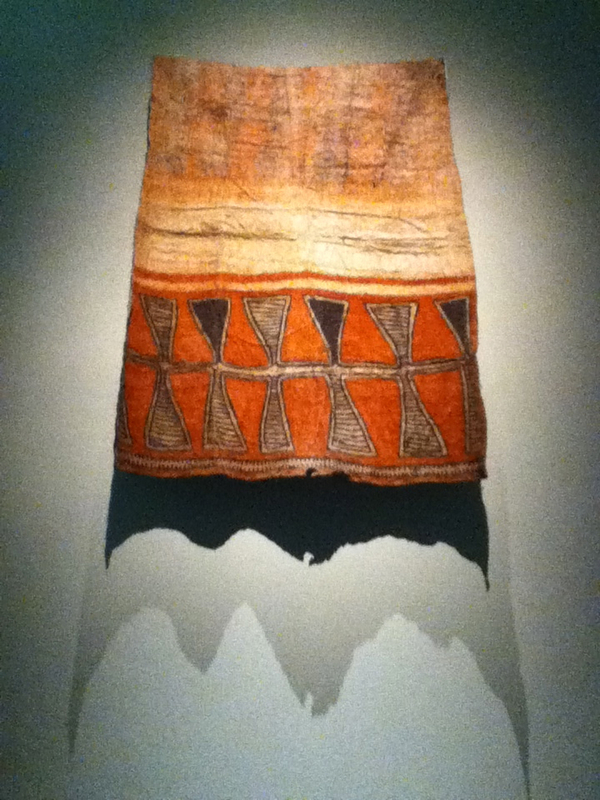 After 10,000 miles, our lovely tanbark sails remain in excellent condition. 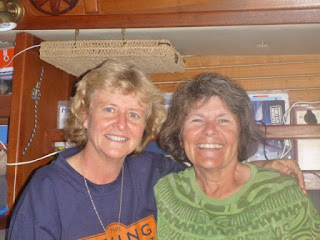 We can’t recommend highly enough the careful work of Carol Hasse and her crew at Port Townsend Sails. 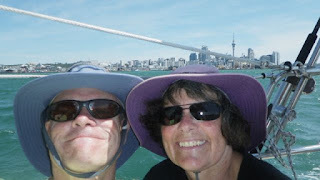 To catch you up on the “eventful” part, we said goodbye to our good friends Stuart and Alison, whose Devonport flat we’d rented, and left Auckland’s Waitemata Harbor in the arvo (afternoon) of a blustery day. We sailed past our much-loved Devonport, waving at our friend Jocelyn, then whisked past dormant Rangitoto volcano and Motutapu Island, did two gybes to clear Motukorea Channel, and came thundering into Owhanake Bay under sail to meet our buddies Don and Deb on Buena Vista. Along the way, a new method of navigation was invented. Jim: A bit windy, isn’t it? Karen: I want a chart in the cockpit for reference, but yeah, it’s awfully windy. Jim: Why not use the cocktail tray? It won’t blow away. The photo below may be historic, the first example in which “navigation by cocktail tray” has ever been successfully tried. 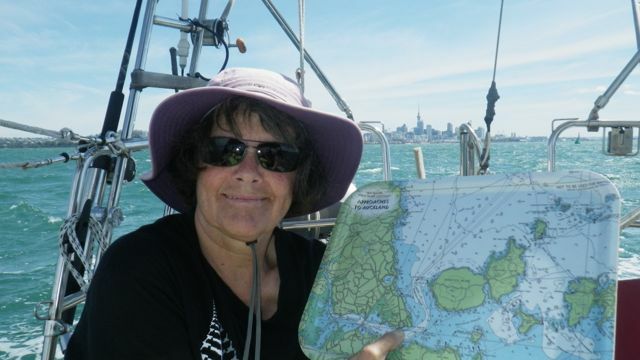 Karen’s thumb denotes the boat’s precise location. You saw it here first, folks. 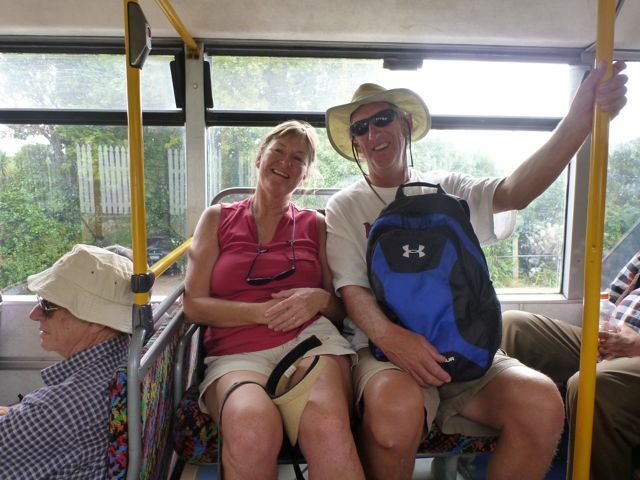 Time flies when you’re with Deb and Don. 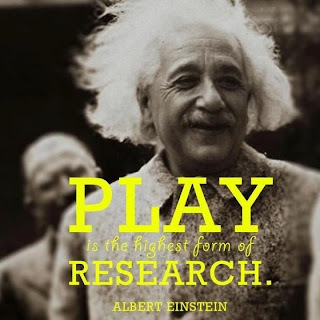 They are two of our favorite people. 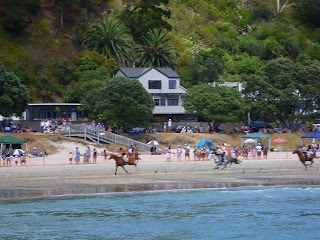 First we hiked, then took a bus trip around the island, then beachcombed, after which both boats sailed up to Onetangi Bay to watch the annual horse races, a century-old tradition. More than a hundred boats showed up to watch and jammed the anchorage. We anchored our boats away from the action and took our dinghies to near the surf line, but later were invited aboard a finely-built, comfortable catamaran named Master Blaster. 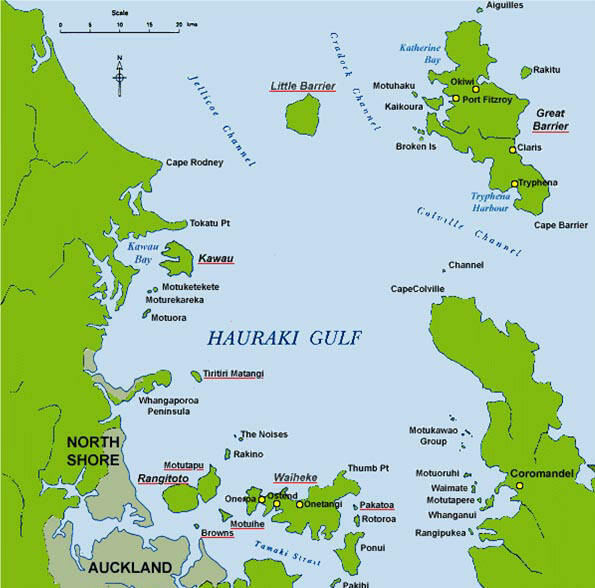 Mark has owned the boat for 30 years, and circumnavigated New Zealand’s North and South Islands in it. Here are the horses dashing down the beach. And here’s the whole gang aboard Master Blaster. Gotta love that name. …but upon reaching the shore, drop their wheels, switch from outboards to inboards, and become slow beach cars. Forgive us for our slack-jawed amazement at these overgrown dinghies. We’ve never seen them before. You can buy one of these beauties for oh, starting around $140,000. Six of them, captained by teams of adrenalin junkies, raced a course that started Le Mans style, on the far end of the beach, then splashed into the water, pulled up the wheels and started the outboard, then roared around the turning buoys at 50-60 mph, then hit (literally) the beach again, started the inboard and sedately wheeled back to the start line. Twice. Boy, was it exciting. 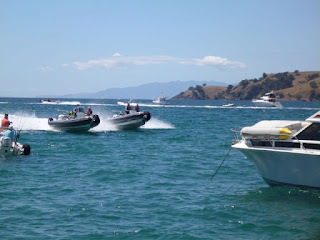 Here they are racing around the buoys. Here they are hitting the beach. 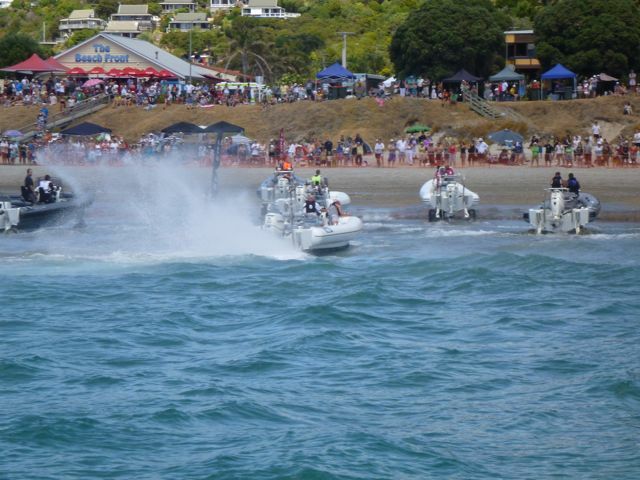 Here they are going lickety-split past the spectator fleet, which suddenly felt awfully, awfully close. The problem happened at the first turn, when the lead boat banked too steeply and nearly flipped. 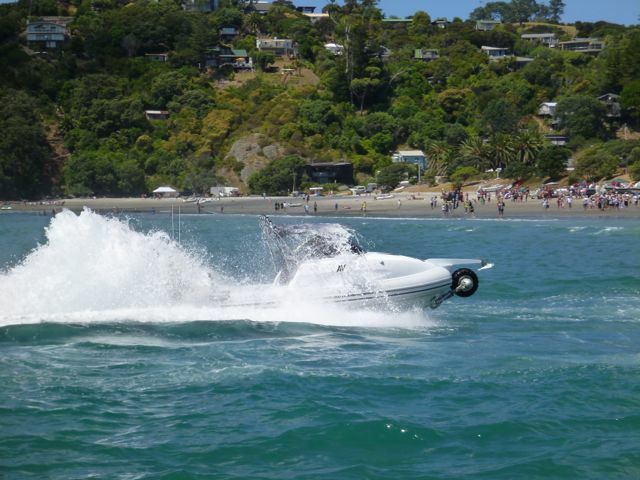 It didn’t flip, but the co-pilot was thrown clear, landing in the water right in front of 5 oncoming speedboats. 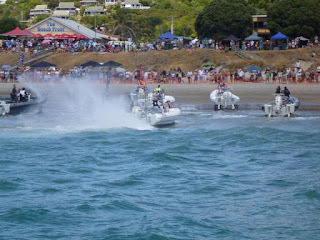 The Coastguards went into action and alerted the fleet, the crewmember climbed back aboard his boat, and the race continued. Big sigh of relief. 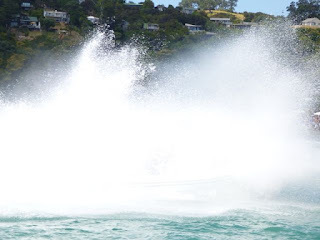 …followed by a second, which threw up so much spray that neither boat was visible for a few seconds. These boats were about 50 feet from us. We think this was the first event of this type, and we bet it’ll be run a bit differently next year. There was definitely an out-of-control feel to it. But nobody got hurt, and it was fun, in a slightly scary way. 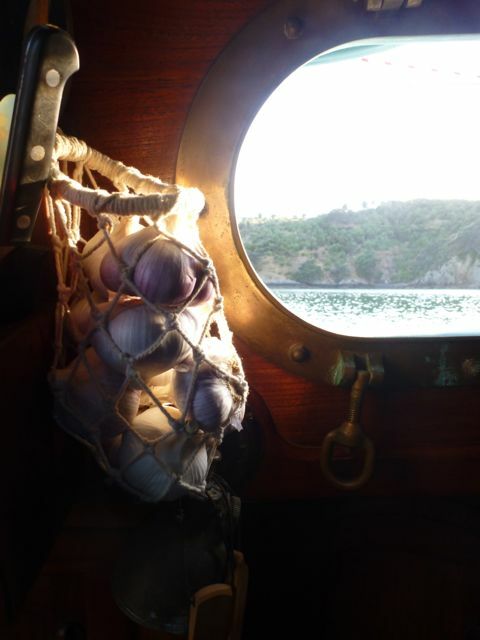 Ahhh, a view from a bronze porthole is always good. 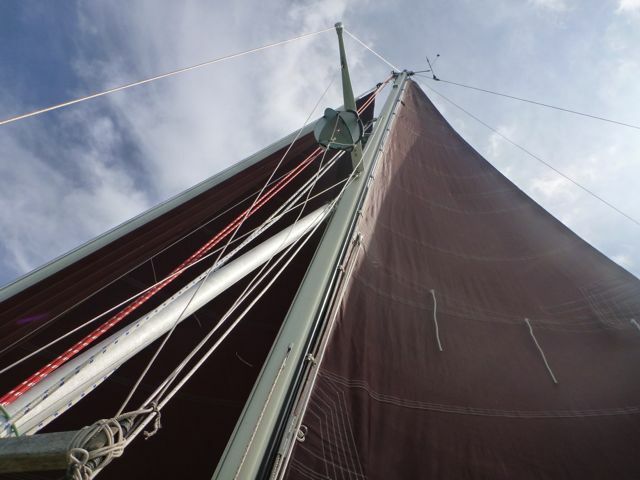 This beauty, a 55-foot Herreshoff Marco Polo schooner, sailed alongside us for awhile. 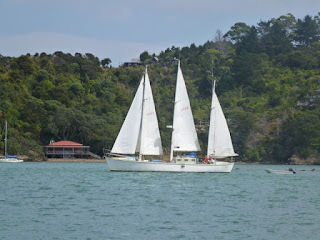 In Chamberlin Bay on Ponui Island at Waiheke’s east end we bid a sad goodbye to Deb and Don, who are going to Australia and leaving their boat in Whangerei while they get settled in their (new) home country. 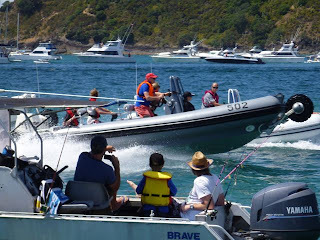 While anchored off a lovely vineyard at Ponui Island, we made the unpleasant discovery that no visitors are allowed ashore anywhere on the island, and signs warn that you will be arrested and prosecuted and fined a thousand dollars if you venture beyond the high tide line. So much for buying wine from that vintner. Time to move on. Pine Harbour, midway down the south coast of Tamaki Strait, was next, and a pleasant stop while a 35-knot front blew through. Walking to town, Jim decided to try the incognito look. Since no vintners came after us, we figure it must have worked. 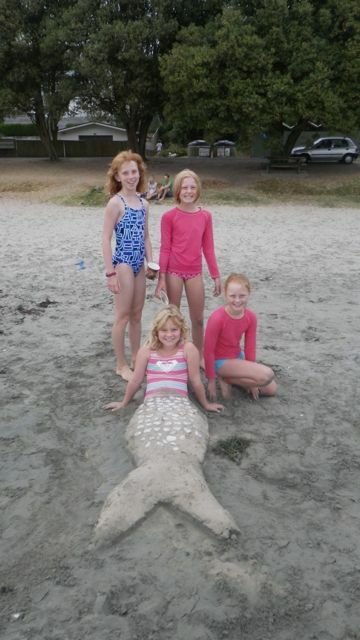 Fast forward to now, and we’ve just had a good visit with Port Townsend’s own Kaci Cronkhite and her Waiheke-based friends Meriel and Jo. 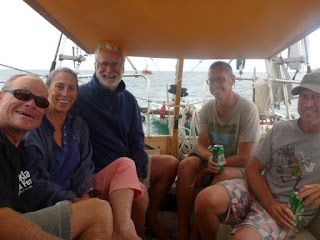 And a laugh-a-minute reunion with our friends Mike and Karen Riley from Beau Soleil (see their cookbook on our book review page), along with two Kiwis named Mark and Phil, who are sailing their cold-molded sloop Icebreaker around New Zealand getting ready for offshore. A fisherman on a 100 year-old launch stopped by and gave us a lovely snapper. 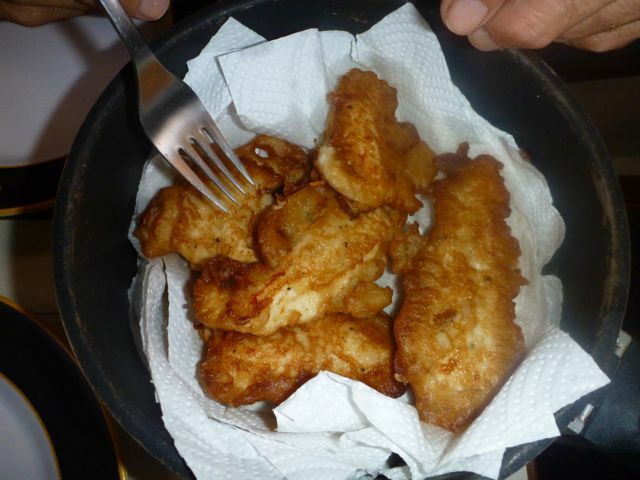 It was quickly converted to fish & chips, beer batter style. While it’s a sad ending to the all-round misery of this yacht abandonment episode, along with the extra expense the owners will probably incur in having it removed from that Australian beach, it’s also good to know that the derelict no longer poses a risk to other mariners. And while we aren’t pursuing this thought further because the answer will never be known, we cannot help but wonder what it was that our friend Rob hit between Fiji and Australia that sank his lovely wooden yacht. He never saw the object he hit because it was a dark night and Rob, a singlehander, happened to be below when he collided. As we’ve written before, there is a lot of stuff floating around at sea; some is flotsam from wreckage, other bits are jetsam that have fallen off or been thrown off ships (think “jettison.”) To add to it by not sinking one’s own boat when abandoning it and thus creating a floating hazard for several months along a major sailing route is unconscionable. 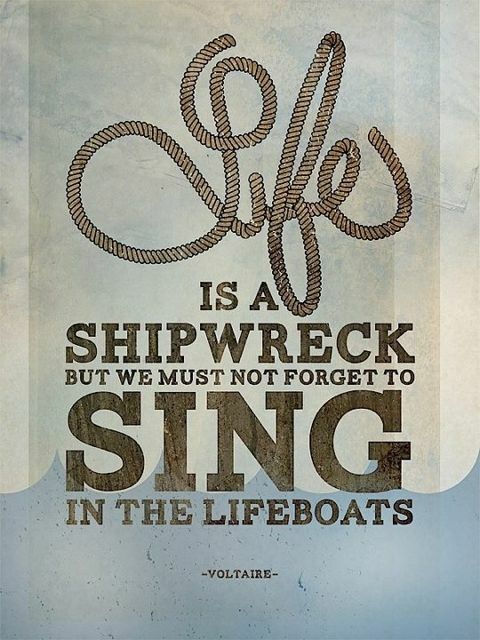 Most experienced mariners agree on this one difficult thing: if you have to abandon your boat at sea, sink it. A lighter note on a Waiheke beach: While wandering the tide line, we found a real live mermaid, surrounded by her ladies-in-waiting! They graciously allowed us to take a photo, then broke into giggles. Time for some more wackily-named foods. 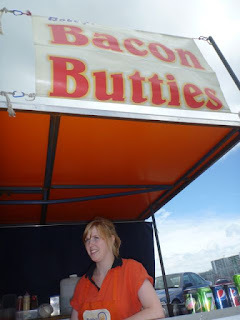 Raise your hand if you’re a fan of bacon butties. 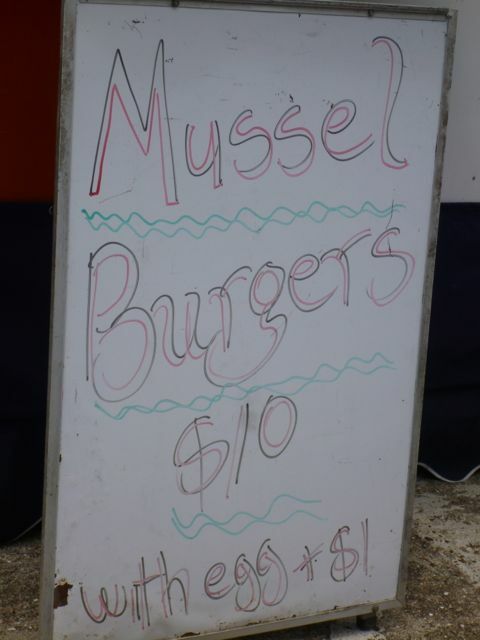 How about a nice mussel burger? In New Zealand, eggs are commonly added to sandwiches. For example, you can get a McLamb at McDonald’s (or not, they’re horrid) garnished with a fried egg and slices of beetroot. Beetroot! AAAAA! Run awaaaay! The weirdest egg add-on we ever had was in Nuku Hiva, though, where the local pizza parlor dropped a raw egg in the center of every pizza just before putting it in the oven. Pizza with an eye, who knew? An announcement: We’re coming home. It's been a fabulous experience to sail all this way in this tiny boat, and we've had a lot of fun, but we are ready to come home now, for many many reasons, not the least of which is homesickness. 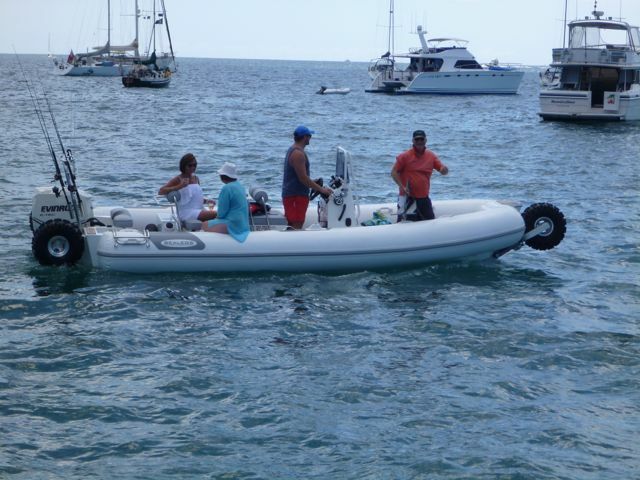 We wanted to make sure the arrangements were possible (putting the boat on a ship) before we let you know, and we have been successful in making them. The heart issue does figure into our decision but is not the primary reason. It's under control with medication, but does go all floppy sometimes and makes me (Karen) a bit tired. All of our many reasons blend together to make this feel like the right thing to do. We look forward to sailing locally and spending summers in our beloved Salish Sea and northern waters. We've been working with a shipping agent to book the boat as cargo on a container ship and then hop aboard the same ship ourselves as passengers, rather than fly home. The only one where we can do both will take us to Oakland, California, which means we still have 800 miles to sail Sockdolager up the California, Oregon and Washington coasts to Port Townsend. We’re not quite ready to end the voyage yet, and this would be a nice way to do it. Other shipping companies could take the boat closer, like Vancouver, but they don't allow passengers, and we'd be flying instead of having a nice 18-day cruise across the Pacific with our little boat on deck. You know how much we love a good story, so we're splurging on this watery option. The ship leaves around May 18 and arrives in Oakland, California on June 6. 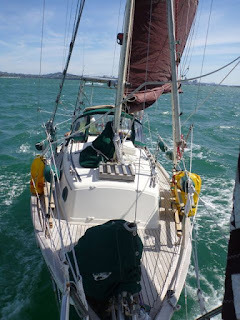 We'll re-rig, visit with friends in the San Francisco Bay Area, and start heading north, harbor-hopping to see the places we missed going south. Basically, shipping the boat involves welding a custom cradle, hauling the boat and lashing it to the cradle, then lashing boat and cradle onto a "flat rack," a container-sized base. The mast will be unshipped and stowed alongside the boat on the flat rack because it’s under 40 feet long. The whole assemblage is lifted onto a truck that drives it to the shipyard, and the ship’s cranes then lift boat, cradle and flat rack aboard and into a container-sized space called a "protected stow." The boat would be loaded last, and likely offloaded first on arrival. 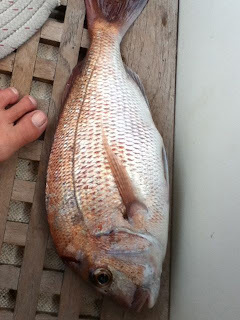 A marine surveyor will supervise the lashing and loading process. We will be snapping photos and reporting back to you on how all of this goes. We've chosen Svenson's Shipyard in Alameda. Keep your fingers crossed for this all to work out! Although we are enjoying New Zealand and have more adventures in store, we are also excited about coming home. Two years away will be enough. Funny how things evolve. Come sail on the East Coast! Hey guys, love the blog. I have been following you for quite some time. I'm curious, now that you have been at it nearly two years is 24' enough for the two of you? Do you ever feel like you want more? Thanks for the great comments, everyone! Richard, it would be great to sail the east coast but we're going to stay in the Pacific Northwest for the time being--perhaps we can cadge a ride on some nice Dana if we drive east, eh? 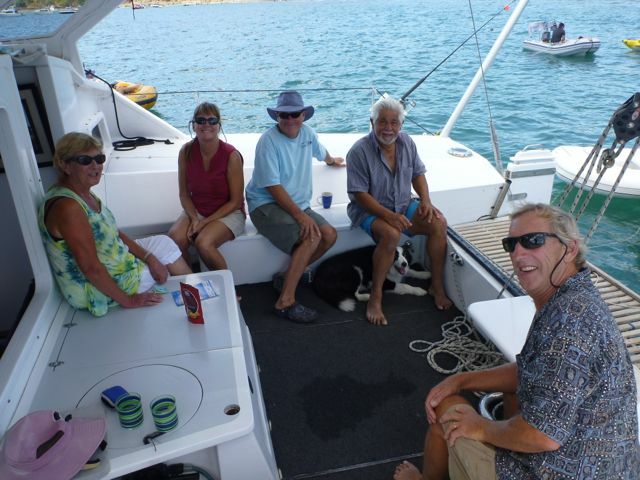 And our boat feels just right for the kind of coastal cruising we'll be going back to. A big reward of going small has been the lack of repairs in port, and the lack of worry that there'll be room in an anchorage or even the rare marina for us. We can afford to splurge on a marina because compared to the big boat rates it's a lot cheaper. We could not have afforded to do this trip on a big boat. 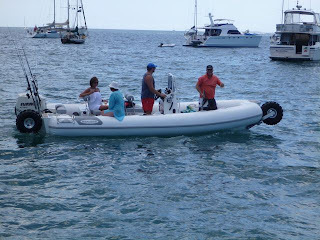 Another thing--it seems that small boats like ours are magnets for curious, friendly people. Maybe it's because smaller is more approachable, but you would not believe the number of times where in an anchorage the party's on Sockdolager, with 6-8 people squeezed in together having a good time while the 40 and 50 footers are quiet. Always seems to happen that way. Don, thanks so much for your nice supportive note. It is quite the decision, but the right one. We are out at the Barrier right now and should be here through the weekend at least, anchored in Port Fitzroy and volunteering our time at the Glenfern nature sanctuary. (Wait'll you all see the photos!) Come on out if you get the chance, and have a beer aboard! You're welcome anytime! That is, assuming I can figure out how to rig my boat. 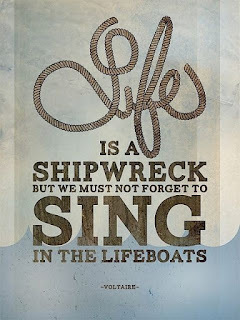 Never sailed a cutter with running backstays.